Route 1 // 9:30am - 1:40pm // 6 stops, but 7 activities. 11 mile total route. Route 2 // 9:30am - 1:00pm // 6 stops. 6 mile total route. Every route is self-driving from stop to stop. Route 3 // 9:00am - 12:40pm // 5 stops, but 6 activities. 8.5 mile total route. ​Route 4 // 9:00am - 12:20pm // 5 stops. 16 mile total route. Route 5 // 10:30am - 2:15pm // 5 stops, but 6 activities. 16 mile total route. If you have questions please feel free to contact us.​ New to Caffeine Crawl? Here's a fun FAQ for you to learn more. 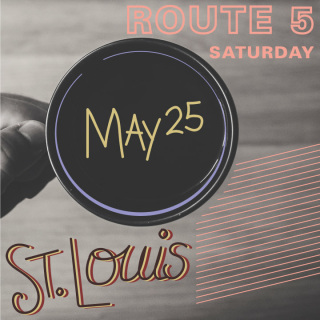 This route 5 is a Saturday route that visits 5 different locations, but has 6 different activities with the dual stop with Coma Coffee and Hugo Tea. This route begins at 10:30am at Kaldi's Coffee Roasting Co. (City Garden location - 315 N 9th St, St. Louis, MO 63101). Other stops include The Mud House, First Crack, Living Room, and this route ends at Coma Coffee with Coma and Hugo Tea at 2:15pm. Total distance of the 5 locations is 16 miles. This is a self-driving route.